'Know your Aircraft - The Seafire XV.' 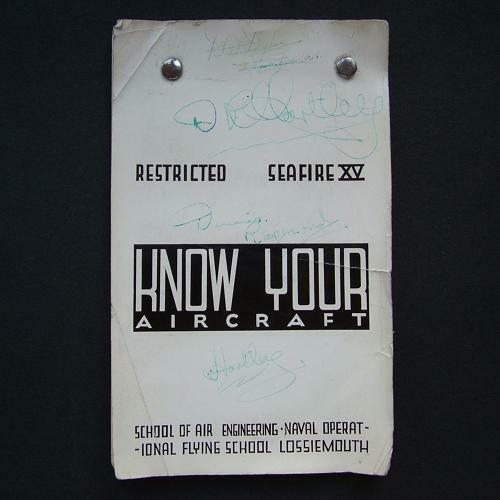 Published by the School of Air Engineering, Naval Operational Flying School, Lossiemouth, Scotland. 'Restricted' booklet printed on photographic paper and bound at the top with paper fasteners. Approximately 10 x 16.5cm. These were used as an additional source of information to the pilots notes and is marked 'can be carried conveniently in your Mae West'. It has basic aircraft details/dimensions, information on the Griffon engine, the aircraft's electrical systems and instrumentation, radio and armanent. The RAF used Lossiemouth during WW2 but the Fleet Air Arm took over in 1946. This booklet probably dates from the late 1940s. Shows use and wear but in good overall condition. Stock code P22873-89.